The biotech giant hasn’t lost a single case, either. Not one. This includes when farmers tried to sue Monsanto over cross-pollination of their organic crops with GMO seed. For example, a federal court dismissed one of those cases, saying that it couldn’t protect Monsanto against unfair lawsuits should they side in the farmers’ favor. What about unfair business practices? What about 92% of people saying they want their food labeled if it contains genetically modified ingredients? What about the right of farmers to grow food from seed that hasn’t been altered to turn it into a DNA freak show? If these facts are representative of a country that has utterly lost its governing bodies to thieves and murderers, then I don’t know what it will take to recover our food supply. Monsanto was given a foot in the door back in 1930 with the Plant Patent Act. Patents – whether on new plants or biotech traits – allow the creator of the technology the opportunity to commercialize their innovation and to obtain a return on their investment of time and money. And while plant patents aren’t all bad, Monsanto and biotech have turned Mother Nature on her head. Seed patents to this extent should never have been allowed to happen. Monsanto isn’t even protecting their ‘intellectual’ property any more, they are grossly infringing on farmers’ rights to grow good food. Our courts are even telling organic farmers they have to rely on Monsanto’s assurances on the company’s website that it will not sue them so long as the mix of GMO to non-GMO is very slight, but what if they don’t want a mix at all? Monsanto can’t control wind, rain, pollinating insects, and cross-contamination carried out by nature for neighboring farms. 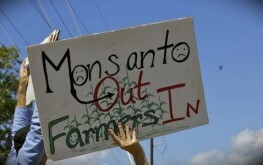 All Monsanto politicians and Supreme Court justices need to fired – immediately. They are no longer ‘for the people’, if they ever were. The entire board and any shadow members of the Monsanto board should be jailed for life. There will be a gigantic explosion of cancer cases and early death from people eating this utter filth. Excuse my post below. I am in agreement with this article. I meant to post this as an argument on a different site. If you can delete my comment, please do. I could not. To all you naysayers:Everything is NOT black and white. such a shame, for all the good they do (and they do a lot of good) its all canceled out by the bully tactics. We are not asking for much, a simple label so we know where our food comes from or if its been altered, I want this on all food not just their food! Humans have been genetically modifying food for thousands of years. Wrong! 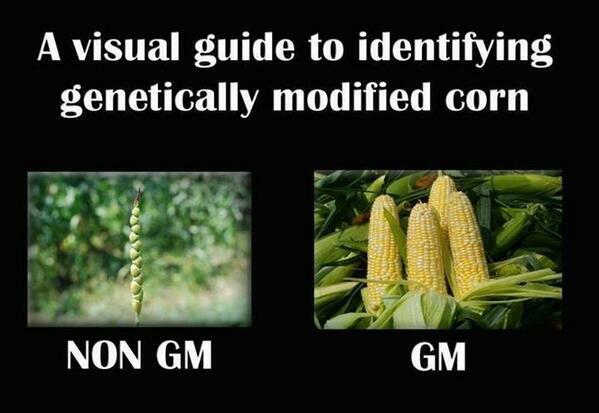 Both of those types of corn were available before Monsanto was involved. Selective breeding is not the same as gene splicing to make corn tolerant to poisons you have patents on. no, it is not. But at a basic level, why do you think geniticaly manipulating through breeding is good stuff ? It has never been tested in the ways folks think GMO should (actually, I have never seen a proposal for what testing would satisfy folks…they just say…not tested fully, therefore not safe). I like non gmo dog food, I find the irony of not feeding gmo grain, to animals not use to grain ironic. And dogs are the most genetically manipulated thing I can think of…like double ironic. I feed my pets grain free. Disinfo agent! the commonly known name for GMO these days means something entirely different from your use of the term AND YOU KNOW IT. You are talking utter garbage, obviously on their murderous payroll. Read Teresa Moore’s post for a start. here I thought is was because they had a patent…same protection under the law as organic seed companies that patent their seeds. courts are money corrupted ? Could you share your insight…do you mean .001 %, 1 %, 10 %. seems…like crazy talk to me. Unfortunately, 999 Americans out of 100 either (a) don’t know what a GMO is; (b) never heard of Monsanto; (c) and if they have, do not associate the world’s most evil company with poisoning our food supply (along with Bayer, DuPont, etc., etc. ); and (d) couldn’t care less. We are doomed. Only thing left is hydroponics and/or acquaponics, maybe. Chenical companies inventing/producing all our seeds, now that makes a lot of sense. Monsanto suing organic farmers (and winning) for cross pollination to their Roundup seeds from heirlooms is like the home break-in perpetrator suing the homeowner for injuring him from the act of protecting his/her family and possessions. Today, the victim is guilty and the evil doer is not only innocent but awarded monetary gain. Bizzarro World. What can you do. We are the slaves to the very few. 999/100? Are you talking about literally 1000% of all Americans? As in 3 billion Americans, even though there are only 300million? It’s a JOKE, or I took it as one. It has certainly been my experience that 999 of 100 people fall into categories a, b c and d on the subject. 999 out of 100 🙂 nice math. I will counter with 99 out of 100 folks who believe ag companies, and biotech are evil…have no science skills. So of course they are suspicious.